After one hundred years in service, the Panama Canal still is one of the most important and impressive engineering achievements in modern times. Built in 1914, it held a prominent role in the deployment of military vessels during WWII and in the conflicts that have followed. Nowadays commercial usage is the core business of the Channel; it's economic impact is profound and has not only developed the region, but in fact helped define shipping throughout the world. 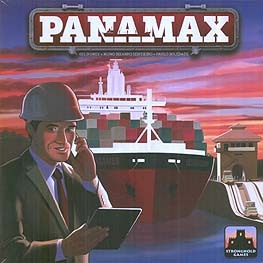 In Panamax each player manages a shipping company established in the Colon Free Trade Zone. Companies accept contracts from both US coasts, China and Europe and deliver cargo in order to make money, attract investment and pay dividends. At the same time the players accumulate their own stock investments and try to make as much money as possible in an effort to have the largest personal fortune and win the game.